“Friends is a mental state." “Are you giving me the high-hat?" “That’s real brave coming from Little Miss Punching Bag"
But, snappy lines on their own don't make a movie - and Miller's Crossing wins on both rich and wild characters (Tom, Verna, Leo, Johnny Caspar, Eddie Dane, Mink, Bernie...) and on story. For me, it is one of the most coherent to follow, plot-wise. Even the first time you see it, without knowing the reveal, you can keep up with what’s going on as Tom Reagan (Gabriel Bryne) narrates the story so far to the people he’s trying to move through this great game. It’s also one of the most compelling, being about love, loyalty and self-interest - in politics. From its opening scene between Johnny Caspar (Jon Polito) and Leo (Albert Finney), to its closing one between Leo and Tom, it’s one long look at power and authority. When he does become top dog, he doesn’t much enjoy it (“Christ. Running things.”) - and we realise how much ‘normal politicking’ is at play in making the people in the city you run think they let you run them because they like you and you’re decent rather than because you could shoot them all. Leo knows that, and is a natural at it, but he forgets that the fact that people generally like him doesn’t mean he can play fast and loose with the rules. He misses his own weak spot, and if it weren’t for Tom it would destroy him. And yet, in the playing out of this story, Leo loses probably the only person who genuinely did want him to run things (if only because he thought Leo was the best of the available options) and probably did actually like him - because that is definitely hurt that Tom is wearing under his hat at the end of the film. Empty Roads? An empty path in the woods, onto which a hat falls and down which it blows. Terrifyingly bright daylight? Nope, no brightness in this movie. The camera does like searching for the daylight through the trees though. Incredible Carter Burwell score? Hell, YES. 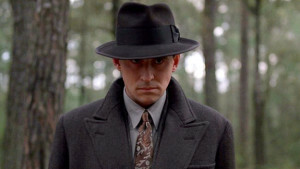 Miller’s Crossing has one of my all time favourite musical themes. It’s the score that made me realise I needed to pay attention to Carter Burwell. Very realistic violence? No-but-yes-ish. Anything involving guns is deliberately theatrical (and who doesn’t want to watch Albert Finney wield a Tommy Gun to the strains of Danny Boy like it’s the opera), but the punching is satisfyingly punchy- while it is staggeringly reminiscent of 40s noir. Tom takes punches like Bogart in The Maltese Falcon and The Big Sleep. Something new - an obsession with odd hair. Well, it’s not new (H.I’s hair in Raising Arizona was pretty hair raising) but in the scene in which the small boy finds Rug Daniels and takes his toupee (‘They took his hair, Tommy. Jesus, that's strange, why would they do that?/ Maybe it was injuns.’) it became an identifiable thing for me. Pretty great female leads? Yes. Verna. Who is objectively Not a Nice Person, and yet I’d rather see her representing my gender on screen than any number of fairytale romantic heroines. “Intimidating helpless women is part of what I do" “Then go find one, and intimidate her." She’s probably the only character who can really keep pace with Tom (Bernie is more of a threat, but that’s because he’s actually crazy), playing the angles - and working out how he is playing his. She owes a lot to Vivien Rutledge (Lauren Bacall in The Big Sleep) and especially Brigid O'Shaughnessy (Mary Astor in The Maltese Falcon) but that's hardly a bad thing, and she's also her own thing. I really like the way the film shows that she is vulnerable to all the shenanigans going on around her, but also smart and strong enough to survive by running the men, not the other way around.